Making an effective true crime thriller is like walking a tightrope wherein the success of your film depends on how well you can balance the devastating facts with sensitivity for the lives that have been touched by the tragic event. 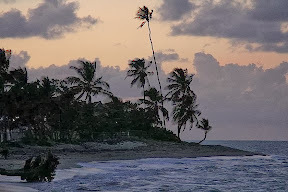 You have to question whether any violence is gratuitous (even if you’re going by police records and press photos) and likewise be conscious of the tendency we have as people reared on heroic narrative journeys to unconsciously root for our main character to ask yourself whether you’re accidentally glamorizing the actions or turning the perpetrator into a hero. At the same time, like a reporter who needs to remain objective and refrain from leaning too far to one side or another, you also need to stop yourself from going the other way to the point where the subjects lose their humanity and become as exaggerated as a silent movie villain tying the hero’s girlfriend to the train tracks. The fine line between making a mere point and making a message movie becomes yet another obstacle that threatens to knock you off that thin piece tightrope even if you know how to balance as well as a Cirque du Soleil acrobat because you’re dealing with a topic that has in all honesty affected each and every potential viewer. Whether they'd heard about the event, turned on the news or picked up a paper to take in the aftermath, you must be ready to accept the fact that every audience member who sees it will bring their own point-of-view and preconceived judgment about the case to the theater before the first frame of your film even flickers. Instinctively aware of these concerns, in his feature-filmmaking debut former music video and short film director Alexandre Moors takes on an altogether minimalist, unexpected approach in his psychological cinematic portrait of the two men who shared a father/son bond beginning in Antigua and ending upon their arrest for the horrific October, 2002 D.C. Sniper killings. 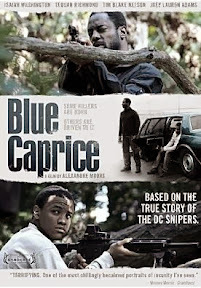 In Blue Caprice, Moors recounts the history behind the events that terrified the nation’s capital and shocked the globe with the senseless murder of thirteen men, women and children. Focusing on the facts mainly to construct the overall framework for the characters’ timeline, Moors and his cowriter R.F.I. Porto opted to push the actual violent crime elements toward the periphery of the picture and instead fixate on the relationship between the two men. 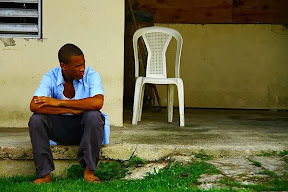 Opening with the abandonment of the Antigua teen by his mother, Lee (Tequan Richmond) is left to fend for himself when – following a desperate moment in the sea – he finds a replacement parent in Isaiah Washington’s John, the American man who rescues him. While he’s forced to relinquish his kids to their mother offscreen, John returns to the states shortly thereafter with the orphaned boy whom he begins referring to as his “other son,” soon grooming him for his own version of a battle against the citizens of a country he feels has wronged him. 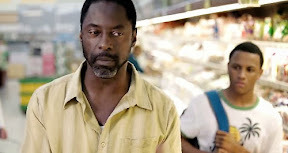 One of the most frightening explorations of a disturbed, vengeful psyche since Robert De Niro threatened to shoot his mirror for looking at him in Taxi Driver, Isaiah Washington’s utterly mesmerizing turn as the mastermind of the sniper attacks is chilling in the way he begins slowly losing his grip on reality, which escalates from start to finish. We see him change drastically from one moment to the next as John plots the “random but not random” shootings in a grocery store before quickly turning on the charm to con the manager into releasing his “son” back into his custody after Lee was caught stealing veggie burgers. And through it all, Washington’s portrayal of John’s disturbing metamorphosis and eerily seductive chameleon-like ability to talk people into things is further proof that he’s one of contemporary cinema’s most underrated actors. After realizing the teen is a natural with a rifle once the two goof around with the gun collection kept by John’s Army buddy (played by Tim Blake Nelson), John begins to train his protégé for battle, conditioning and manipulating him to prove his love and obedience with a few test crimes in Seattle that set them up with the used blue Caprice John fashioned a shooting bay out of in the trunk. And when the wife of Nelson’s character (played by Joey Lauren Adams) remarks “what an awful car” as the two men drive out of sight, her dead-on assessment is the understatement of the film as little did she or the rest of the world know what madness John had in store with regard to that blue Caprice. Admirably avoiding the actuality of gory carnage and senseless shootings which makes the emotional impact of the implied violence all the more horrific, Moors spends a majority of the final act investigating the dynamic of the men and the way they execute their plan as opposed to zeroing in on the killings themselves. Serving as yet another reminder that a movie is far more thought-provoking for what it doesn’t show than why it does, Blue Caprice likewise raises more questions than it offers answers. 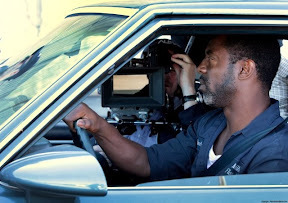 Respecting the intelligence of his audience, Moors and Porto strengthen their already solid movie by ending things on such an abrupt note that it forces viewers to engage in a conversation about what they’ve just seen The noblest goal for any true crime thriller – Blue Caprice gets people talking about why these things happen in the first place. 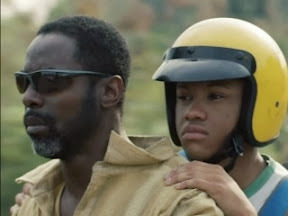 And while it’s unfortunately too late to change what happened in 2002 – as Moors drives home in his striking debut feature it’s never too late to try and dissect events of the past to see if we can learn from them in order to stop these things from happening again in the future. Yet far from being a message movie or too overly optimistic, Caprice reminds and ultimately warns us that sometimes as much as we want answers, there’s no reasonable explanation that could make us understand why and how someone could do what these two men did in 2002 that could put a stop to all public shootings in the future. 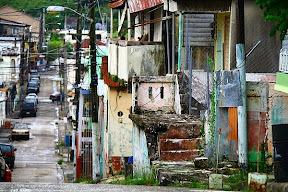 Leaving us with as many dead ends as there are potential solutions, one of Blue’s strongest realizations is that while one of the sniper’s motives was vengeful madness, from the eyes of a teen desperately in need of a parent, another motive was love. And given the two conflicting thoughts pulling us in two different directions at the same time, we begin to see that what Moors needed to make the film is the same thing we need to view it – namely, the balance to keep everything in perspective. Anchored by the haunting turns of its two leads including Tequan Richmond’s understated performance that helps ground Washington when his John begins to dominate, Moors's auspicious debut is now available on DVD to coincide with and celebrate its Independent Spirit Award nomination for Best First Feature.